If Israel is the Light of the World, What Happens to the Church, Part One? After the exiles are gathered and Israel’s enemies destroyed, those who are left from the nations will not only dwell peacefully with the nation of Israel, but all peoples will come to recognize the one God of Israel and will serve him. It will be a worldwide revival such as we have never seen before. While it is Messiah’s job to bring this global repentance about, it will be accomplished through the agency of the Jewish people and will come about when they dwell securely within the land. Indeed, this awakening can only happen when the children of Israel are connected with the land of Israel. I think most Christians would agree that Messiah (Christ) will inaugurate an era of worldwide peace and tranquility upon his return, but they might be puzzled as to what the Jewish people and the land of Israel have to do with it. Isn’t the Church supposed to rule and reign with Jesus? Aren’t the Jews supposed to convert to Christians and effectively eliminate any and all Jewish presence on Earth for the first time since Abraham? One of the reasons I don’t share a theological perspective with most of my Christian brothers and sisters is because, even though there may be those who recognize that the Jews have “some part” in God’s future plans to redeem the Earth, couldn’t possibly imagine that it is national Israel and the Jewish people, not “the Church,” which is the principal mechanism by which we will all be saved, even as the Master said, “salvation comes from the Jews” (John 4:22). However, Toby Janicki in his article makes the argument that the children of Israel was and is God’s chosen people and nation for a very good reason, and that reason stretches all the way back to Sinai. To fully understand how the Jewish people will bring the nations to the knowledge of HaShem, we need to understand why God singled out and chose Israel in the first place. We need to examine the Jewish people’s role as a light to the nations. This begins with HaShem designating Israel as his chosen people. Toby cites Exodus 19:5-6, Deuteronomy 14:2, Deuteronomy 32:9-10, and Romans 3:1-2 to define and support Israel’s continued election from among the nations. But the “choseness” of Israel has always been a bit of a problem to the rest of us. In today’s modern society the idea of this kind of election can be troubling. The premonition of God choosing one nation out of all the others does not sit well with our Western sense of egalitarianism. But before jumping to conclusions, we must ask the question, what does it mean that Israel is chosen? Christianity has attempted to respond to Israel’s chosen status in a couple of ways. The traditional response of the Church was to establish a binding tradition declaring the Christianity and the community of (Gentile) saints as having replaced Israel’s special status with God as an act of Jesus Christ and his death on the cross. Of course this makes Messiah a traitor to his own people and the nation he loves. Can Yeshua turn away from God’s treasured, splendorous people, HaShem’s Am Segulah (Deuteronomy 14:2), wholly decoupling himself from the Jews, the Jewish land, and his very identity as a Jew, and cleave only to a foreign people, making himself, in essence, a foreign god? In my opinion, the answer is a resounding “no”. There is another competing opinion that sadly treats the Jewish people no better. What if Jewish election is meaningless? What if the work of Messiah was simply to take all the Gentiles who become his disciples and make them “Israel” too? That would mean in the Messianic Kingdom, there would only be two people groups, Jewish and non-Jewish Israel, and the unbelieving Gentile nations. Since the former group, by definition, are resurrected and immortal, and the latter group is not, after the latter group dies, only “Israel” made up of Jews and non-Jews remains and there are no nations of the earth. Being Jewish would mean nothing since the Gentiles in “Israel” would be every bit as “chosen” (although much later in the game) as the Jews. This violates more prophesies than I have room to cite and both of these misguided theories eliminate God’s original choosing of the children of Israel as His chosen people and nation, either by removing that status from the Jews or making to totally meaningless. It seems people have to rewrite God’s original work to fit their own needs and requirements, more’s the pity. But if Yeshua is the light of the world (John 8:12), why does he need Israel and the Jewish people to fulfill his mission to be a light to the world? Why does he need anyone at all? But what if he and Israel are inseparable components within that light? Toby quotes Rabbi Levi Welton to answer the question he asked above. In other words, one separates something to do something, not just to be something. So the Jewish people were separated for a purpose, not to carry a higher rank or be a “favorite.” This purpose is to tell the world that they are also “chosen to do good,” as Isaiah says it, “to be a light unto the nations” (Isaiah 49:6). This suggests that the Jewish people had and still has a special mission to bring knowledge of monotheism and the One true God of Creation to the rest of the nations. But how were they supposed to do that, especially since post-Biblical times, most Jews do not acknowledge Yeshua as the Messiah? In the minds of the sages the Jewish people’s exile (galut) from the land of Israel was not only punishment for Israel’s sin but also served a redemptive purpose for all mankind? That’s bound to bend the minds of some Christians since it means that the Jewish people as a whole were still being used by God in post-Biblical times as exiles among the nations, and that non-Jesus believing Jews are fulfilling God’s purposes to this very day. …and therefore this saying is a metaphor for the knowledge of HaShem being spread among the nations of the world through the exile of Israel. This would seem to create some problems. First, it puts Judaism and Christianity in direct competition to make proselytes (converts) as part of spreading the knowledge of HaShem in the former case, and the Gospel Message of Jesus Christ in the latter case. It also means that, from a Jewish perspective, if spreading the knowledge of HaShem requires making proselytes, then no Gentile person could benefit unless they converted to Judaism, which is also against many of the prophesies in the Tanakh (Old Testament). Although we have seen some fulfillment of Israel enlightening mankind throughout history, and although the nation’s exile has served a redemptive purpose, Israel’s call to be a light to the nations can be fully fulfilled only when they dwell securely within their land with their own sovereign monarchy. So here we have a connection between Israel as a light to the nations and Messiah, since one of Messiah’s critical tasks is to re-establish the sovereignty of Israel and to return all of the Jewish exiles to their Land. If Israel can’t be a light to the nations until those events have occurred, then Messiah is absolutely required in order to allow Israel to complete her mission. This brings up a question about the role and function of Gentile Christianity. If everything hinges upon Israel having complete rule over her nation, all the Jews returning to Israel, and King Messiah being established on his throne, what happens to us? Toby writes all this as future events, but we are here now, aren’t we? What are we, chopped liver? Toby doesn’t address this question and he seems to indicate that only Israel will participate in the worldwide revival and return to the God of Abraham, Isaac, and Jacob. I can see those non-Jews who identify as “Messianic Gentiles” within some recognized form of Messianic Judaism participating in a supporting role, but with no mention of the Church in this scenario, I can imagine many Christians feeling left out in the cold. And yet, I know of many Christians who live holy lives, who do good, and who are devoted to God, and yet they do not have a “Messianic Jewish” perspective on the scriptures, nor do they anticipate Israel having such a “stellar” role in God’s redemptive plan. They fully expect that it will be the Christian Church who will step in and be “the light of the world” alongside Jesus Christ. I wonder what happens to them? Since Toby’s article is rather packed with information and meaning, and since I want to cite another author in the current issue of Messiah Journal, I’m going to stop here. See you in Part 2 of this article. You being a gentile christian (or your kind) isn’t really a issue, but the issue of the religion of christianity is how they operate G-ds commandments, and some sects border/if not do Avodah Zarah ….. Many place Jesus on G-ds throne putting the cart before the horse “so to speak”. Is that not wrong? Is that not offensive to Jews? G-d is the only one who is the Savior of the Jewish people (not Jesus in the sense most in christianity caricature it). They were saved in the book of names (shemot) and required continual salvation from there on. All these were physical salvations btw by G-d, not His physical servant Jesus. Judaism never believes “once saved always saved” etc……… Would they (Jews) not be offended of such missionizing tactics? Since the Tanach never says such. Do christians ask why is there a difference in what is called salvation from the Tanachs perspective and the NT? You just left a christian place of worship after two years of faithful attendance. Doesn’t your experience show you the dire need for christians to shift their theological perspective? And ALL types of people can do good deeds…. We are taught in Judaism that every person has a repository of holiness, it’s just hidden. But only through G-d can one achieve and unearth it. In sincereness James or anyone for that matter how would a christian respond to the following about jesus being the messiah? So over in the win-lose column it looks like 2-5. How would christianity respectfully answer these above references in regard to Jesus? What can the “church” teach in regard to these matters? Jews believe and have been taught that in every generation, a person is born with the potential to be the mashiach. If the time is right for the messianic age within that person’s lifetime, then that person will be the mashiach. But if that person dies before he completes the mission of the mashiach, then that person is not the mashiach. What happens to the church? They see the error and repent, like all of humanity should do. BG: In times past, some of the sages did indeed believe that Isaiah 53 referred to Messiah. Do you have any explanation/analysis about the remainder of what Jews refer to Messiah being based on the Tanach? And how that fits in the scope of Jesus? From a Christians perspective of scripture understanding? @BG: Actually, I’ve written a bit on this topic before in blog posts such as The Church When Jesus Returns and When Jesus Returns Will We Go To Church, so I’ve already “tipped my hand,” so to speak. Zechariah 12:10-14 speaks of the mourning of Israel when they come to the knowledge, as a nation, that Yeshua is King Messiah, and Jeremiah 31:34 speaks of Hashem forgiving the sins of national Israel and their return to Him. I can only imagine that “the Church” will face a similar time of making teshuvah for our sins against Israel and the Jewish people, as well as our misguided beliefs that “the Church” has superceded Israel as the active agent in God’s plan of worldwide redemption. Then our sins too will be forgiven and we Gentile believers as a body will come alongside Israel in the Messianic ekklesia. I suspect there will be individual Jews and Gentiles who will still reject King Messiah and reject God’s plan of redemption, and if they remain in their sins, there ultimately will be only judgment. @BG — One of the problems with your win-lose calculations is the conundrum that forced the sages to consider two messiahs. In evaluating Rav Yeshua one must come to grips with the distinct role of the ben-Yosef messiah, which Rav Yeshua enacted two millennia ago, and the question about whether we could have avoided this long exile and welcomed the ben-David messiah shortly after the completion of the ben-Yosef tasks. The sages do discuss in some detail the question about what may happen if Israel is not worthy to receive the messiah when he attempts to come. So, as matters now stand, the goyim have had ample opportunity to demonstrate that they could fail morally even worse than Jews did during the preceding millennium, despite having the grace of HaShem available to them; and we may expect Rav Yeshua to return before very long to finish what he started, by fulfilling the ben-David tasks. The common Jewish focus on the requirements for the ben-David messiah rather that those of ben-Yosef is what confuses the calculus. @James: Your links never covered what I discussed above. Given the length of your blog articles I thought you’d go into depth about the topics your writing on and not just skim the surface. I assume your reason for a lack of further analyzing boils down to time, audience, and resources? Fascinating to read none-the-less. @James: In “When Jesus returns we will go to church” comments section. Proclaim Liberty (PL) gives positive and valuable input about Gentiles in regard to the practice of Judaism and the stream of Judaism called “Messianic Judaism”. “The church” should be prayed for that they come to accept the authority of the Torah & Tanach, and stop reading and interpreting the bible backwardly. @PL are you referencing Zechariah 12:10-14? And my above reasons about explaining if Yeshua is the Messiah based off what the texts is saying are valid questions that non-followers of Yeshua (especially Jews ask) have. My hebrew grammar is still growing but in direct response to Messiah ben Yosef remark (Messiah son of Joseph), are you aware of the problem that presents? because Mashiach ben Yossef (Mashiach the descendant of Joseph) of the tribe of Ephraim (son of Joseph), is also referred to as Mashiach ben Ephrayim, Mashiach the descendant of Ephraim. He will come first, before the final redeemer, and later will serve as his viceroy. We can already see where this would lead. Saying Jesus is from Joseph now and not David or G-d and He’s from the tribe of Ephrayim fly’s in the face of the NT. PL we both know that In view of the divergent Midrashim and interpretations on this subject it is practically impossible to present a more definitive synopsis that would go far beyond bringing a clear result and answer. Thus it is wisest to cite and follow R. Chasdai Crescas who states that “no certain knowledge can be derived from the interpretations of the prophecies about Mashiach ben Yossef, nor from the statements about him by some of the Geonim;” there is no point, therefore, in elaborating on the subject go Messiah ben Yosef. @BG — I was not referencing Zech.12:10-14 specifically in my comment about speculations over what happens if Israel is deemed unworthy when the messiah tries to come. There are other speculations about whether he will come gently riding a donkey or carrying a sword of judgment, depending upon Israel’s behavior. Further, the ben-Yosef nomenclature is not necessarily a reference to physical descent from Ephraim (or Menashe). Hebrew idiom uses such terminology metaphorically to indicate that this messiah shares characteristics of Yosef, such as rejection by his brothers, rising to prominence due to miraculous help from HaShem, held captive among foreigners, and redemption of foreigners even before his own family members come to receive his help (even failing to recognize him until he revealed himself). This is not to say that all the ben-Yosef speculations were entirely accurate, but they open the door to considerations that also are uncomfortable, and confusing, and thus deemed unprofitable. Considering that they lead to positive consideration of Rav Yeshua, they are deemed suspect by those who try to defend Jews from Christian missionizing. Great post James. I have a question for you. 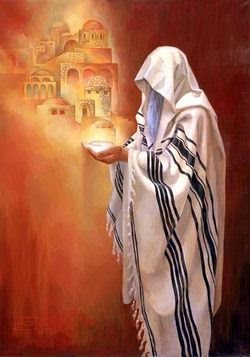 Based on my reading and interpretation of your posts I concluded that you believe that a Jew must participate in some type of acknowledgement of Yeshua as Messiah and his being the way for forgiveness of sin as requisite to have peace with God and a place in the world to come. This post calls that conclusion into question. Must a Jew become a Yeshua Messianic? James, thanks for reviewing my article! Glad you enjoyed it. @BG: Well, I had to leave something for part two which publishes tomorrow. You’re right though. If I addressed every single point, I’d be writting a book and not an essay. As far as what happens to the Church, see Part Two tomorrow. @Daniel: I covered that answer more completely in my blog post Why No One Comes to the Father Except Through the Son. That said, both Jeremiah 31:34 and Romans 11:25-27 indicate that all Israel will be saved (redeemed). I don’t know what happens at the level of the individual Jewish person, but I’ll take God at his word that He plans to redeem all of Israel, the Jewish people, since He chose them for His own. How he does that, I don’t know. I only know He says He will do it, so I believe He will. @Toby: Thanks for the correction. I must have read too quickly over that part of your conclusion. I’ll include it in Part Two of this article which publishes tomorrow morning. Which I believe your referencing in your last post? PL did you notice that this option (although not present or suggested in the biblical text), makes the prophecies conditional (as you mentioned)—depending on Israel’s righteousness at the time of Messiah’s approach—and therefore the conflict is resolved by one side NOT being ‘fulfilled’ at all. Your thought analysis presents a (conditional and/or complimentary view of fulfillments). This has the advantage of recognizing that many prophecies ARE conditional, as taught in Jeremiah 18 and illustrated in the preaching of Jonah against Ninevah. This, in a messianic context, is sometimes appropriate as well, as can be seen both in the rabbinics and in the words of Jesus. Note that the messiah’s coming, in this passage, was conditional upon the receptivity of Israel (or of its representative, in this case). Note that Elijah had come (in the person of John the Baptist), but because Israel had failed to recognize/chosen not to receive him, he would have to come AGAIN later, to fulfill the rest of the forerunner ministry. Notice Jesus also likens Israel’s response to Himself, to this same behavior of Israel. So, this option that you present can be legitimate, but unfortunately, it won’t solve our problem at all—for the promises of world leadership, world peace, etc. could be conditional as well, and without textual clues as to this being the case in any specific passage (although many of the passages of promise DO require a righteous Israel), it would be entirely unwarranted, with this view (presently). I can expound more but out of respect for the blog authors I won’t. 1)We do understand that the Tanach describes a wide range of roles for the messiah, some of which are at tension with others. 2)These tensions are present in ANY system that attempts to take the Tanach seriously—Jewish or Jewish-Christian. 3)Attempts to resolve the tensions concentrated around splitting the messianic figure into two figures, making the descriptions conditional, or ascribing them to different times/situations in a single messianic figure. 4)Under any of these proposed resolutions (Jewish or Christian), the problem of messiah-recognition would exist. 5)The tensions are mainly concerned with how to integrate the data describing a Suffering/Rejected messiah, and the scriptural data describing a Triumphant/Acclaimed messiah. 6)The “one-messiah, two-appearances” option does a better job of explaining the biblical textual details, without unwarranted introduction of multiple messianic figures, and without compromising fulfillment of all the messianic promises. 7)This option also explains why the New Testament data is always speaking about Christ’ “sufferings before exaltation”. 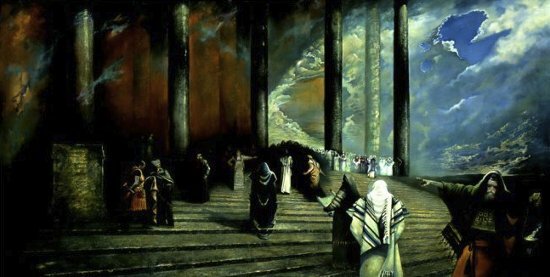 “The Church” as per the blog topic isn’t equipped to explain and dialogue in such a manner to be an effective witness to the Torah of G-d. It takes a collectiveness of Messianic Jews with proper understanding of messiah to explain to other jews and even gentiles about the proper understanding of Yeshua. As I mentioned before “the church” and its tactics to “save” are in no way a help. But those christians despite forcing jews to reject yeshua, cause some of them to return to G-d and live a jewish life. So even xtianity serves the divine plan. By George, I think you’ve got it, “BG”! @PL — I will say I admire and seek to strive for the level of analysis in which you process the text from the Hebrew….. You being in Israel, I’m pretty sure your a good person to talk with that will force the MJ or OJ to re-think there understanding of the Tanach and sayings of Yeshua. I tend to think of the “mystery of the Gospel” as how the Gentiles can benefit from the blessings of the New Covenant (Jer. 31, Ezek. 36) which was made exclusively with the House of Judah and the House of Israel. A critical error has crept into Christian theology. It’s the assumption that the Gentiles “own” the New Covenant and that the New Covenant replaced the Sinai Covenant. In actuality, Gentiles are “saved” (redeemed) only through the New Covenant made with Israel, so Israel “owns” the New Covenant, we just receive mercy from God and get the bread crumbs that drop off the Master’s table, so to speak. Also, I believe the New Covenant contains the identical conditions as the Sinai Covenant, so nothing was cancelled. For those Jewish people (most of them at this point) who do not currently recognized Yeshua (Jesus) as Messiah, the Sinai Covenant is still in force, thus God is still involved in their lives and they are doing the work God has called them to do. He is, I believe, also preparing them, Israel as a whole, for the return of Messiah, and like the brothers of Joseph at first didn’t recognize him because he was disguised as a foreigner, one day, the “Goyishe mask” will be taken from his face, and all Israel will turn to God through Moshiach, thus all of Israel, and then the rest of us, will be saved. Part Two of this series published this morning Dan, so if you haven’t done so already, please read it as it ties up all the loose ends (I hope). I don’t quite understand why is it so hard for Christians to grasp that Jews do not ” acknowledge Yeshua as Messiah” not because they in the ‘darkness”, but because they do VERY CLEARLY see that 1) it would be a grave sin and a betrayal of their Husband to worship a triune god and a demigod (a human being) instead of only the G-d of Israel who revealed Himself to them long ago AND who warned against that very thing, 2) that Jesus has not fulfilled any of the messianic expectations and not even the required genealogical prerequisites, and 3) that, those who followed Jesus, both Jews and Gentiles, have seen and still see the Jewish people as blind, deceived, wrong and as enemies working against G-d in one way or another, either knowingly or unwittingly. Also, Dan, what do you mean by “HaShem keeping them [Jews] out of love”? I think that as a Holocaust educator you should really be more careful with your words. Gene… I, for one, do not see the Jewish people as “blind, deceived, wrong… enemies working against G-d”. I am supporting their very active role in HaShem’s unfolding plan of redemption for the world. Regardless of our differences re: the legitimization of Yeshua’s messiahship, I am also speaking directly to G-d’s love for the Jewish people–then, now, and in the future–in the above post as I have never considered them enemies of God or Christianity, etc. (except as a child when being raised Roman Catholic, unfortunately). As for “HaShem keeping them [Jews] out of love”, this is a statement on my part of G-d’s eternal, unchanging love for the Jewish people throughout all time. Acknowledging HaShem’s love of the Jewish people is what drives my determination as a Holocaust-educator-activist. I do it in service of HaShem. I defend the memory of the Shoah out of deep love and respect for G-d, first, and the Jewish people, second, as they are the apple of His eye, not for political or academic or humanistic moral reasons. I do it as an act of faith and loyalty to the King of the Universe as a subject of His kingdom. I’m not sure how my post came across as a derogatory statement rather than a statement of complete affirmation and support regarding HaShem’s eternal love for His people, Gene, but I hope I’ve cleared that up. I love the Jewish people with a heartfelt love as an act of faith in and loyal service to the G-d of Israel. As well as, of course, in my case, as an act of faith in and loyalty to Yeshua as Messiah. As a Gentile I’ve thrown my hat in the ring with the Jewish people out of love for and a sense of overwhelming gratitude to the Jewish people for all they’ve done, and for all they’ve suffered, to bring redemption to the world. I see no greater motivation and inspiration to defend the memory of the victims of the Shoah, or to fight the forces of modern antisemitism, than that. Dan, I took “keeping them out of love” as Jews today not being on the receiving end (that is kept out) of G-d’s love because of their rejection of Jesus. I see that this is not what you meant. Thanks for clarification. that, those who followed Jesus, both Jews and Gentiles, have seen and still see the Jewish people as blind, deceived, wrong and as enemies working against G-d in one way or another, either knowingly or unwittingly. That’s traditionally true of most or all Christians and probably many in Hebrew Roots and Messianic Judaism, but it is not a universal truth and that attitude is slowly changing. I reviewed an article written by Rabbi Stuart Dauermann called “The Jewish People are Us – Not Them” published in Issue 114 of Messiah Journal, and Dauermann strongly addressed this matter. Also, since you know Dan is a Holocaust educator, if you’ve followed his activites at all, you should be aware that he very much supports the Jewish people and is not involved in any proselytizing activities. I’m sorry if you see me or anyone commenting as attacking the Jewish people. Please believe me, it was never my intent to come across as offensive. I do understand that we are going to disagree on many fundamental issues but if we let this dialog go that route, we’ll be debating probably until Messiah comes/returns and settles it once and for all. Like I’ve said in the past, I don’t want to argue. We both know what the other believes and we both realize that we are unlikely to convince the other to change his mind. Every now and again, my wife, who is Jewish and not Messianic, and I briefly enter these debates but most of the time we know better than to bring it up. She accepts (to the best of her ability) that I have my path and she has her’s. If she ever invites me to speak more about mine, I will gladly share that with her, but I know not to attempt that conversation without an invitation. Gene, I didn’t see your latest comment before I posted my response to the first one. Looks like you and Dan got things sorted. Gene, having re-read my statement, it could be read as a negative. Thanks for understanding.